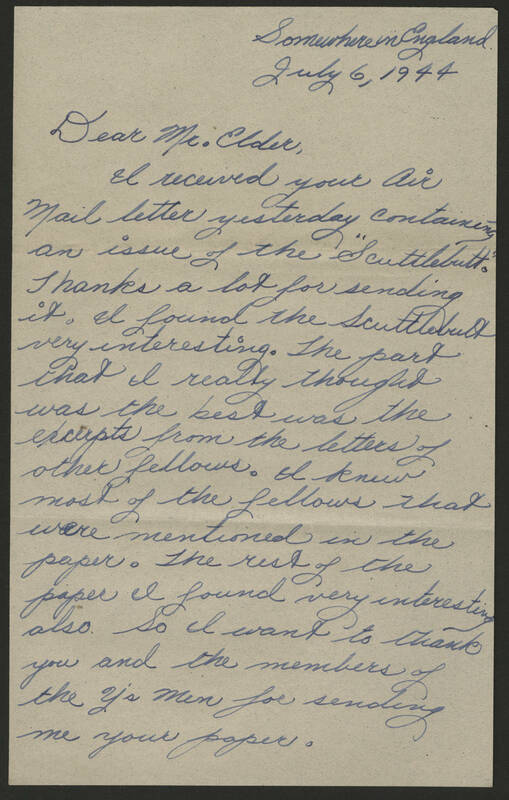 Somewhere in England July 6, 1944 Dear Mr. Elder, I received your Air Mail letter yesterday containing an issue of the "Scuttlebutt." Thanks a lot for sending it. I found the Scuttlebutt very interesting. The part that I really thought was the best was the excerpts from the letter of other fellows. I knew most of the fellows that were mentioned in the paper. The rest of the paper I found very interesting also. So I want to thank you and the members of the Y's men for sending me your paper.